WARSAW, Poland (AP) — A spokeswoman for Poland’s prime minister sought Sunday to downplay his words equating Polish collaborators in the Holocaust to alleged “Jewish perpetrators” by saying the remark was an invitation to a frank debate about World War II crimes against Jews. Israeli politicians accused Polish Prime Minister Mateusz Morawiecki of anti-Semitism after his comment Saturday at the Munich Security Conference, raising the temperature of a diplomatic dispute over Poland’s new law banning some statements about the Holocaust. Morawiecki and Israeli Prime Minister Benjamin Netanyahu had their second telephone conversation in three weeks Sunday and agreed to work together to soothe the intense feelings about World War II history in both countries. In a sign of the tensions between the two nations, someone painted black swastikas, expletives and the word “murderer” on the entrance to Poland’s Embassy in Tel Aviv, Israeli police said Sunday. They have launched an investigation. 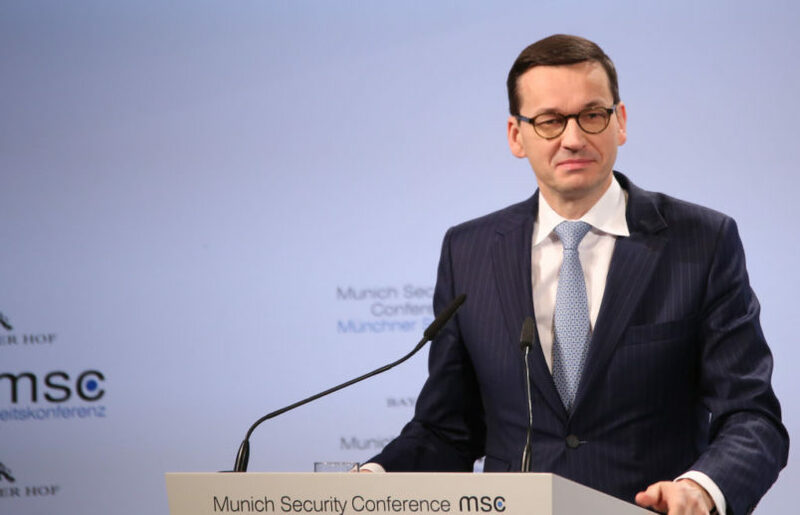 Morawiecki made the comment as he was responding to an Israeli journalist’s question about the new Polish law, which criminalizes falsely blaming Poles for Holocaust crimes that were committed by Nazi Germany during its occupation of Poland. The journalist said his parents’ families were reported to the Nazis by Polish neighbors and asked if he would be charged if he had related the story in Poland. “There is no need to apologize for telling the truth,” Mazurek said. Morawiecki “has repeatedly and categorically opposed denial of the Holocaust — the murder of European Jewry — as well as anti-Semitism in all its forms,” the statement said. The spokesman for Polish President Andrzej Duda said the strong reaction in Israel “should not be ignored” but also attributed it partly to internal political tensions in that country. The spokesman, Krzysztof Lapinski, said Morawiecki’s reply was in Poland’s interest and meant to explain the new law. Poland’s conservative government has said the law is needed to protect Poland from being slandered for crimes committed by Nazi Germans that took place during the 1939-45 occupation and to make the wartime suffering of Poles clear to the world. Poland lost six million citizens during the war, half of them Jews.